Woodlands bowler Mark Lawson sends down a delivery against East Bierley last Saturday. Woodlands extended their winning run in the All Rounder Bradford Premier League with a 102-run derby victory over East Bierley last Saturday. Woodlands posted an impressive total of 312-5 thanks to a brilliant second-wicket stand of 255 from captain Tim Jackson and new signing Jamie Pickering. Jackson struck three sixes and 14 fours on his way to a top score of 125, while Pickering made a maiden Bradford League century. Pickering’s excellent 115 included three sixes and 15 fours to set up the Woodlands innings, despite the efforts of East Bierley spinner Shaaiq Choudary (3-78). Former East Bierley captain Kez Ahmed then claimed 5-58 on his old ground as the hosts were dismissed for 210. Bierley opener Fahid Rehman made a season’s best 77 and captain Adam Patel made 45 but were unable to prevent their side slipping to a second defeat. Woodlands are one of four sides who have won their opening two games, with champions Pudsey St Lawrence setting the early pace. Saints capitalised on a dramatic New Farnley batting collapse to earn a five-wicket win. Farnley raced to 130-2 before a sudden collapse saw them lose their as the last eight wickets for just 39 runs as they were bowled out for 169. Opener Simon Lambert made a sparkling 94, which included a six and 15 fours, while support came from Martin Andersson (33) before spinners Chris Marsden (4-31) and Archie Scott (4-31) on debut sparked their collapse. St Lawrence captain James Smith made an unbeaten 64 to steer them to victory after opener Adam Waite (37) had set the early platform. Pudsey lead the way with 59 points from their opening three games and they face a trip to Woodlands this Saturday, with the Oakenshaw side joint second on 57. 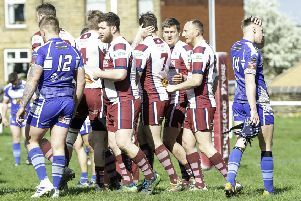 Farsley entertain East Bierley aiming for a fourth straight win, which could see them move top depending on the result at Albert Terrace, while Hanging Heaton are at New Farnley.